Make your books mobile. The Scoot Book Cart is an all steel cart featuring tubular steel legs and a durable black powder coat finish. 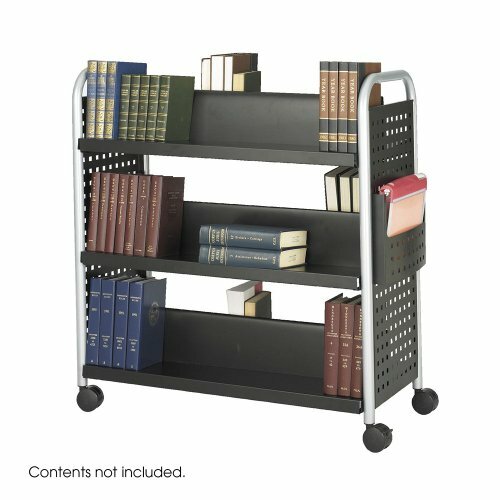 Over-sized casters for easy transportation of books and other reference materials. The double-sided cart has six slanted shelves 8"D with 12" clearance between shelves. Includes a height adjustable file pocket. Tools Required: Yes. UPSable: Yes. Wheel / Caster Size: 3" dia. Shelf Clearance: 12"h. GREENGUARD: Yes. Assembly Required: Yes. Wheel / Caster Style: Dual Wheel Carpet Casters (two lock). Shelf Quantity: 3 (double sided slant shelves). Paint / Finish: Powder Coat. Material(s): Steel. Finished product dimensions: 41 1/4"w x 17 3/4"d x 41 1/4"h. Finished product weight: 62.4 lbs. Color: Black. Actual weight: 73 lbs.